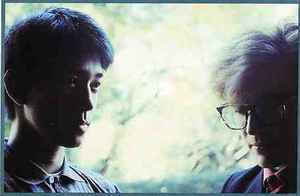 Japanese composer and pianist Ryuichi Sakamoto first worked with English singer-songwriter David Sylvian in 1980, when he played keyboards on 'Taking Islands in Africa' track for Japan - Gentlemen Take Polaroids album in 1980. A proper collaboration happened two years later, with a Bamboo Houses / Bamboo Music single co-produced by Steve Nye and released by Virgin in 1982. Steve Jansen from Japan plays drums and also appears in the promotional video. Sylvian and Sakamoto worked together again in 1983, this time on a Forbidden Colours, the theme song for the Nagisa Oshima's film 'Merry Christmas, Mr Lawrence'. It was released as a single and also appeared on the movie's soundtrack album. Next year the track was re-recorded and released as the B-side to Red Guitar, the lead single from Sylvian's first solo album Brilliant Trees (later also appearing as a bonus track on some editions of Secrets Of The Beehive in 1987). Alternative versions and variations of the song were recorded and performed by both artists: for instance, an orchestral version with Sylvian's vocals appears on Cinemage 1999 album. Also, Sakamoto on several occasions recorded an instrumental version of the theme from 'Merry Christmas, Mr Lawrence'. In 1991 Sakamoto and Sylvian together with Arto Lindsay recorded a song called Heartbeat (Tainai Kaiki II), released as a single from Sakamoto's ninth solo studio album Heartbeat. Sylvian also contributed vocals for Cloud #9 track on US and UK versions of this album. Both artists periodically appear on each other records in following years: Sylvian was featured on Salvation from Discord in 1998, Sakamoto played Fender Rhodes on several tracks and also provided orchestrations and arrangements for Sylvian's fifth solo album Dead Bees On A Cake. David Sylvian also wrote lyrics for Zero Landmine project in 2001. As a part of Ryuichi Sakamoto's Chain Music project, the duo recorded new material in New York and New Hampshire in the summer of 2003. World Citizen EP was originally released by Warner Music Japan and re-issued in April 2004 on Samadhisound in the UK with a different artwork and alternative playlist. Both versions include Ryoji Ikeda remix. David Sylvian performed a title track World Citizen - I Won't Be Disappointed on his Fire In The Forest Tour '04, and Sakamoto released it on a Chasm album the same year.